26% reduction in lighting power by using efficient lamps and fixtures. 25% of the materials, by value, have recycled content. 76% of the materials, by value, were manufactured from within 500 miles of the project. 87% of the construction waste has been diverted from landfills. 93% of the total value of new wood used in the project is Forest Stewardship Council (FSC) Certified. 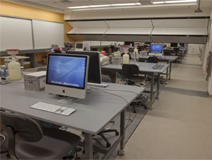 A fit-out of approximately 16,000 square feet of laboratory and office space in the basement and 1st floor of the Northwest Labs building was completed in September of 2009. With the Teaching Labs project, the primary vision of Harvard’s Faculty of Arts and Sciences (FAS) and the Committee on Learning in Science and Engineering (COLSE) was to create a better physical environment for undergraduate learning in science and engineering. They aimed to create an environment that offers flexibility to meet the changing needs in the science field while encouraging collaboration between students, teachers and faculty. As part of the design exercise to fit out the Teaching Labs, the architects examined the physical and pedagogi-cal assessment of all the existing teaching labs in the Faculty of Arts and Sciences. In addition to creating flexible interdisciplinary spaces, the Teaching Labs design allowed for the development of more efficient lighting and HVAC systems. Careful selection of furnishings and finishes was an important element of the project, as was a careful plan during construction to improve indoor air quality. In support of Harvard’s goal of reducing greenhouse gas emissions 30% below 2006 levels by 2016, inclusive of growth, FAS and the project team were committed to sustainability from the onset and throughout the duration of the project. This dedication ultimately allowed the Teaching Labs to achieve a LEED Gold Certification under the LEED for Commercial Interiors (LEED-CI) version 2.0 rating system.